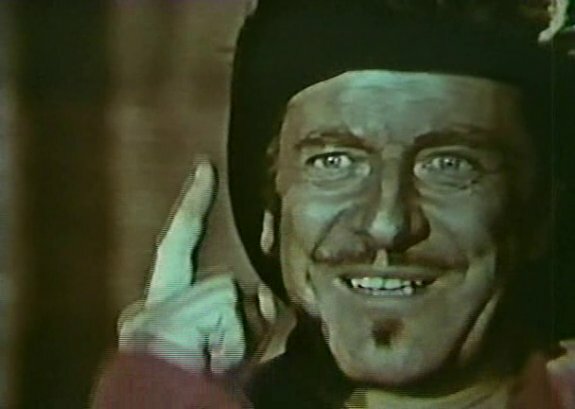 When the French teamed up with the Italians in 1959 to make a pirate movie for release the next year, one could be forgiven if the viewer was antsy that such a pairing might result in the sort of new wave pirate movie fans of Italian swashbuckling tales wouldn’t recognize, much less enjoy. Would all the action take place in a guy’s flat with improvised dialogue between three characters moaning about the pointlessness of the human condition while unconventional filming techniques were used to show not only contempt for cinematic tradition, but also for the audience itself? Not to worry though because while the film of course showed contempt for its audience, it did so in a way that a pirate movie starring the very buxom and ill-fated Belinda Lee (Messalina) would be expected to. Certainly, the French influence on the film was obvious with its extra dose of dancing scenes and more blatant focus on cleavage, but overall the film hews to the tried and true methods the Italians used to take the potential for all sorts of island adventure and high seas mayhem and totally ignore it in favor of interminable scenes of people babbling and scheming. And when guys aren’t doublecrossing other guys during this dance of dullness between the goody goody governor who loves Marie (Lee) and the crooked official who runs a smuggling operation and is also married to Marie, the movie has lots of fast forwardable moments where dudes are riding horses, watching native dancing, and Marie is moping around her room. All of this would be forgiven of course if the villain was particularly villainous, the hero was particularly heroic, Marie was breathtakingly beautiful or the action scenes were sufficiently well staged such that I didn’t need to stick a mirror under my nose to confirm I was still alive and had not passed on to some purgatory where movies about grubby thugs endlessly prattling on about where the governor of Martinique had gotten off to, unspooled leisurely for all eternity. The villain though was such a wimp he not only could not consummate his marriage with Marie, but was simply pushed down real hard by her during one climatic moment and was then repeatedly pushed away by the hero shortly thereafter, the hero was a feminine sort who frankly inspired more loathing than the villain with his self-righteous priggishness about stuff like rum being smuggled to the natives, and Marie was a heavily made up battle axe who most of us would rather be press ganged into the British Navy than spend more than an hour or two with. The action in the film was such that when it did happen, it inevitably involved the afore-mentioned pushing and shoving, a lamely staged sword fight where no one looked like they were trying too hard, or bad guys were dispatched in silly ways such as accidentally being pushed (again what is with all the pushing in this movie, can’t these French throw a freaking punch?) into the spiky business end of what looked like a coat rack! Jacques du Parquet, a representative of Cardinal Richelieu, comes to the inn Marie’s father runs and contracts with her father for some ship building. He spends only a single night there, but shows the deleterious effects of malnutrition caused by long ocean voyages when he instantly falls in love with Marie. While Belinda Lee does an excellent job of filling out her deliciously low cut serving wench costume (as does her friend and co-worker at the inn), the rest of her is pretty off-putting from all the make up she has to wear on her harsh-looking face to the way she melodramatically throws herself on her bed when she discovers that when Richelieu’s representative returns months later, it isn’t Parquet, but is the villain she will be forced to marry. Parquet returns to the area once he is appointed governor of Martinique and his anti-smuggling crusade causes him to run afoul of Marie’s new husband. The rest of the movie details these two guys talking about how they are going to put a stop to one another. Parquet also announces he is going to marry Marie once he is able to denounce her husband as a smuggler which is all well and good, but he misses the much more important opportunity to denounce him for not being able to convince Marie to consummate their marriage! Surely, there could have been some biting banter about it during a sword fight. Is it that difficult to snidely remind the guy of the need to keep his épée raised during times of intense physical exertion? I guess it is when your hero and villain don’t even bother having a sword fight! Not much happens to distinguish Marie of the Isles from the rest of the early 1960s pirate vs. smuggler European adventure movies other than it is even more blandly slow than other lackluster efforts of the era. Marie does get a bit more involved than perhaps the standard girlfriend role would normally demand (to her credit she does bring a bit of excitement to things when she interrupts the executions of her friends by shooting the joint up shortly before Parquet returns to save the day), but if that sort of thing appeals to you, a movie like Tiger of the Seven Seas handles it all so much better on every level that I would rather watch that 100 times than five minutes of this movie once!